Our Mush Push: Take Me to Your Winery! Take Me to Your Winery! Fortunately, a new winery opened in 2008 that was very close to Leland. 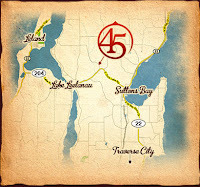 This new winery, 45 North, proved to be a real delight. We had a charming woman assist us during our tastings. It probably didn't hurt that she was "tasting" along with us. If you've not done a wine tasting before, there is a typical order to it. You go from white (dry to sweet), rose (dry to sweet) and red (dry to sweet). I love dry whites. The dryer the better. At 45 North, we went through their first 5 whites and loved everyone of them. I was particularily pleased with their unwooded Chardonnay. It was delicious. And as I have a intense dislike for oaked Chards (Mom- please note, I did not say hate), I was really pleased to be able to bring home some Chardonnay. Since my wine cellar only got half stocked...it means I've got to make another visit in the Fall. Oh, darn. It's a dirty job, but somebody has to do it. I wanna go! I wanna go! Sounds wonderful. I had a great trip to a winery outside of Seattle last year. I'd like to get to a few more next visit. You went to my friend Joanne's blog, too. Have you joined the yahoogroup we both belong to for paper art? I can't remember. If not check it out. That is where I do a lot of my mailed out swapping. byhandartists yahoogroup. Just go you yahoogroups and do a search. It's fun to looks through peoples photos if nothing else. The winery being named 45 North reminds me of signs we saw in MI making a sorta big deal about that spot being at the 45th parallel...halfway point between the Equator and the North Pole. I've never seen such a sign here in WI. 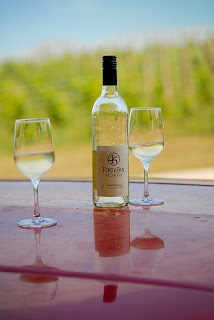 I'm not really a wine drinker but sure did love visiting the wineries and all the tasting. MI is such a cool state but seems to me it gets a bad rap and I'm not sure why. That's okay...keep the hidden treasure to yourself. i wanna go too! MMMM, we're coming in the fall..